The Alapaha Blue Blood Bulldog is a grand, powerful, exaggerated bulldog with a broad head and natural drop ears. The purpose of this Breed is: Guardian, protection, companion, sport and farm use. As a family guard dog, the Alapaha's mental characteristics and abilities are very impressive. These dogs have been used for centuries as a do-all farm dog. They are used for working cattle and catching hogs. They show strength and alertness, yet agile and athletic, having an amazing endurance. This canine gives the impression of nobility, therefore, the name; Blue Blood. Guarding his master's person, family, and property is a natural instinct of this Breed. They were never bred for aggression, but he will protect, and go into action if and when the need arises. The Alapaha is a natural playmate and protector of children; he will for instance play different with a three year old than a twelve year old. He can also get along well with other animals, even cats. The Alapaha's coat is relatively short and fairly stiff. They are average shedders. Their coat comes in a variety of colors; blue merle, brown merle, red merle brindle, tan, red, brown, black, and white. The Alapaha Blue Blood Bulldog is very intelligent and you will be able to teach your dog whatever you feel his/her abilities should be. They excel at obedience. Therefore they are easy to housetrain and they will learn to walk on a leash within two days. 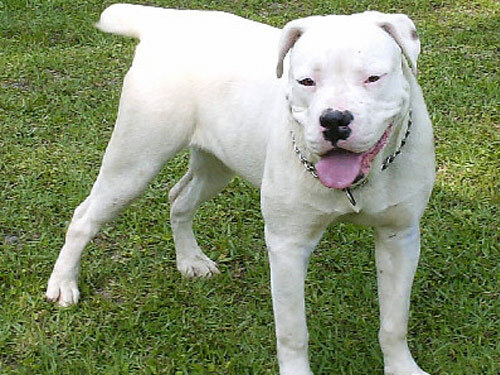 The Alapaha Blue Blood Bulldog is very energetic and athletic. They will do well in an apartment if they are sufficiently exercised. They are very inactive indoors and will do best with at least an average-sized yard. They are used for working cattle and catching hogs, thus their muscles are long and powerful. This means that they are never stocky and short built and their muzzle is not short like that of a Boxer for instance. Their longer muzzle makes breathing easier while running. These athletic, active dogs have a demand for exercise. They will enjoy long walks or running around and playing.